The first book in the Barefoot William series. There's a place where the ocean meets the shore, where kicking off your shoes and baring some skin is as natural as sneaking under the boardwalk for an ice cream cone and stollen kisses. But life isn't all beach for Shaye Cates, even if her idea of an office is a shady umbrella at the water's edge, equipped with cell phone and lap top. Trace Saunders is her upstanding, button-down albeit handsome nemesis. He thinks only of business. A century-old feud has separated their families. Yet a volleyball tournament and kids' baseball games draw them together. Beneath the twinkling lights of the ferris wheel, the magic of sea and sand soon sweep away their rivalry. Suddenly it's summertime...and the lovin' is easy. This is the first book I've read by Kate Angell and I enjoyed it a lot. I am now one of her readers and cannot wait to get my hands on her other books. No Tan Lines is full of romance and not just from Trace and Shaye, your two main characters. You have Kai and Nicole, and a little of Dune and Sophie. Kate Angell gives you a taste of just about every character’s world in No Tan Lines. Every four or five chapters you are inside the head of a different character and getting their point of view on things. I really liked this. Even though at times this can be very confusing for me, I really think Angell pulled it off well. It was super funny and entertaining. Trace of course is my favorite. Trace and Shaye find themselves in an old rival between families. They hate each other and stay on opposites sides. So you can imagine when they began falling in love with one another the troubles they found themselves in. It was nice reading and waiting to see how things would end for them. You can feel the chemistry coming off the pages between these two. No Tan Lines is a fast read and very easy to follow. I cannot wait to read the next book in the series. 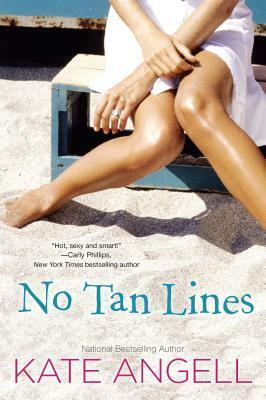 If you want something simple, entertaining, romantic and funny, pick up No Tan Lines. Contemporary romance is my escape and my time to refresh on reads. I recommend this book. A good contemporary romance is needed every now and then. Something nice and easy can be really refreshing. Sounds like a great read for a lazy afternoon. One of my favorite romance tropes is enemies to lovers. I can't wait to see how this couple overcomes their and their families differences to be together. Ooh - sounds cute! I read some of Angell's baseball romances a few years back and had some mixed results. I'll definitely be checking this one out, though. Love the title. This sounds like such a cute read! I've never read this author's work before, so I'm excited to give her a try... thanks for the rec and insightful review! Sounds interesting, I've never read one of Kate's books. I'll have to check it out. Damaris - thanks for the review! I'm glad you enjoyed No Tan Lines.